Jim advises Bernie Sutton to ride his bike on the left side of the road. Julie tells Des that she's resigning from the bank. Helen and Lucy tells Jim that they've heard Bernie Sutton has had an accident - he's been killed riding his bike. 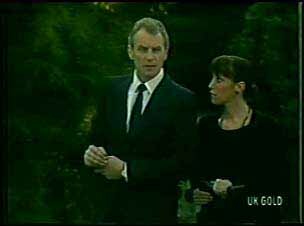 Jim and Maria get out of Jim's car wearing black - they've been to Bernie's funeral. It's even more tragic that Bernie's mother can't have any more children. Max and Terry drive up in his plumbing van. Max tells Maria that it's a terrible thing about Bernie. Maria asks Max if Shane is angry with her - he hasn't been in touch at all. Max says it's nothing to do with him - he hardly sees Shane himself - most of the time he's out "cavorting with that stripper". Maria asks Max to talk to Shane - Danny misses him if nothing else. Max says he won't interfere - they'll have to sort things out on his own. Jim sees Danny on the street and they talk about Bernie. Danny tells Jim he's a bit annoyed with Shane - they never see him now since he's moved in with Max. Just then, Bob Sutton comes over. He's come to thank Jim for coming to the funeral. Also he tells Jim that he owes him an apology - every day of his life he'll regret not listening to Jim's advice about road safety. His son is dead because he told him to ride into the traffic. Jim says that the school is starting a bike training course. Bob appreciates Jim's involvement in this and he recognises his own stupidity. 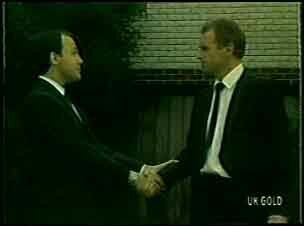 Jim offers his support to Bob and his wife and they shake hands. When Bob has gone, Paul comes up and tells Jim that he's invited Terry over tonight. Des is playing with the kids, pretending to be a tiger. The kids obviously love him. Later, when the kids have gone to play in their room, Des sits down, exhausted. Joan thanks Des for taking them all to the zoo today. Joan says they'll come over to his house on the bus tonight. Des hadn't realised things were so tough. Joan says she gets $280 a fortnight, so there isn't a lot left over for things like taxis. Des says Joan deserves a better deals than that. He gives her money for a cab. Joan says she doesn't want Des to think he's using her, but he says that's the last thing he'd think of her. Daphne and Terry are chatting about what Joan might be like. Just as Des and Paul come in, Terry opens a letter and is very pleased by the contents. Her divorce has come through! Shane answers the door to Danny. He's pleased to see him. Danny gets straight to the point and says that Shane is upsetting Maria by not coming round. Shane says he didn't know he was upsetting her - he's just been a bit thoughtless. He says he'll make things up with Maria. 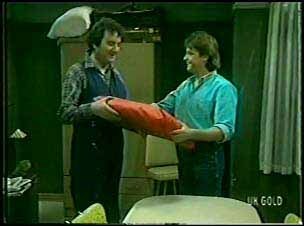 Danny asks how things are at the bedsit. Shane says it's awful living conditions, but if he doesn't stand by Max, who will? Shane has wrapped up a present for Max. He tells Danny it's his secret weapon. 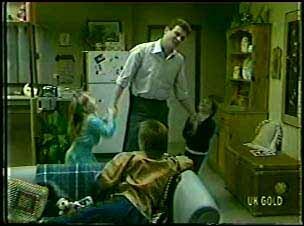 Joan and the kids are there and have been introduces to Paul, Terry and Daphne. They're all getting along well playing animal games. Paul and Terry head off. 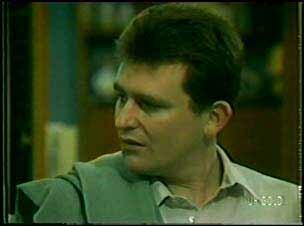 Paul tells Des that Joan seems really nice. Daphne heads off too. She tells Des quietly to be careful - Des is a pretty good catch for someone in Joan's situation. When everyone has gone, Des and Joan sit down happily together. Joan says she was really nervous about meeting Des's friends, but they are nice people. Maria and Danny are watching television when the phone rings - it's Shane. He invites Maria to go out to dinner with him tomorrow night. She is very pleased and accepts. Shane tells her it's about time they had a bit of a chat. Danny has only heard one side of the conversation so Maria winds him up saying she's going out for dinner with a young man. He doesn't look pleased, but Maria lets him off the hook and tells him she's going out with Shane. Danny looks very relieved. Max has just come back from the pub. Shane gives him the present. It's an anti-snoring pillow. Max refuses to use it, but Shane says Max could just try it. Max has a go at Shane for always going out with Daphne. Shane says that he's going out with Maria tomorrow night. 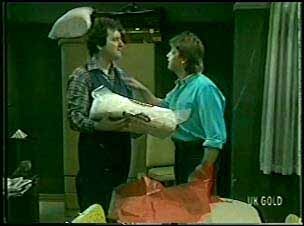 He tells Max that he should get his life organised - he can't go on living in the bedsit forever. If he really wants a divorce from Maria, he's got to start enjoying life again and not fighting it. Des has rung a taxi to pick up Joan and the kids. Joan thanks Des for a wonderful dinner. Des asks Joan how she'd feel about moving in with him. He knows it's a bit impulsive but he's fallen in love with Joan. Joan looks a bit shocked. She says she doesn't know if she loves Des yet - she can't move in with him though, because of the kids. The kids need stability, even if it is just her and the flat. If she moved in with someone, she'd have to be sure - sure enough to marry someone at least. She wants them to carry on the way they are, to see how things turn out. Paul and Terry are chatting about Des and Joan. Terry is a bit despondent about marriage - she and Joan are both divorced, and Max and Maria nearly are. 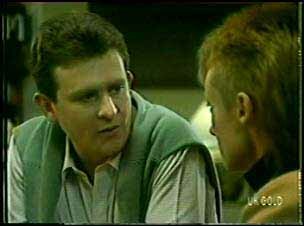 Paul asks Terry about Shane again, but she says she doesn't love Shane any more. They have a pash, but just then Des comes round and interrupts them. 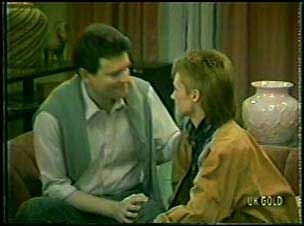 Des tells Paul that he's head-over-heels in love with Joan and doesn't know what to do. He says if you're in love you shouldn't hang about. They both look thoughtful. Des thanks Paul for helping him to make up his mind. Paul says that Des has helped him to make up his mind too.